Then I moved the washer and dryer back and moved them again a few years later. I also but some bins on the other area of the ledge. That area didnt hold up as well as the floor area that had been prepped. However, tire wear made some of the paint come up. in the prepped area. I even made sure that I didnt use the garage for a week to let the stuff bond. I think it might have come up is because our tires are stickier than most. I drove the car into the garage when it was raining and the hot tires in combination with the moisture caused the paint to stick to the tires and come up. If isnt bad and is only in a few spots. I would recommend getting some carpet remnants and putting them where your tires normally would be after the car is parked. 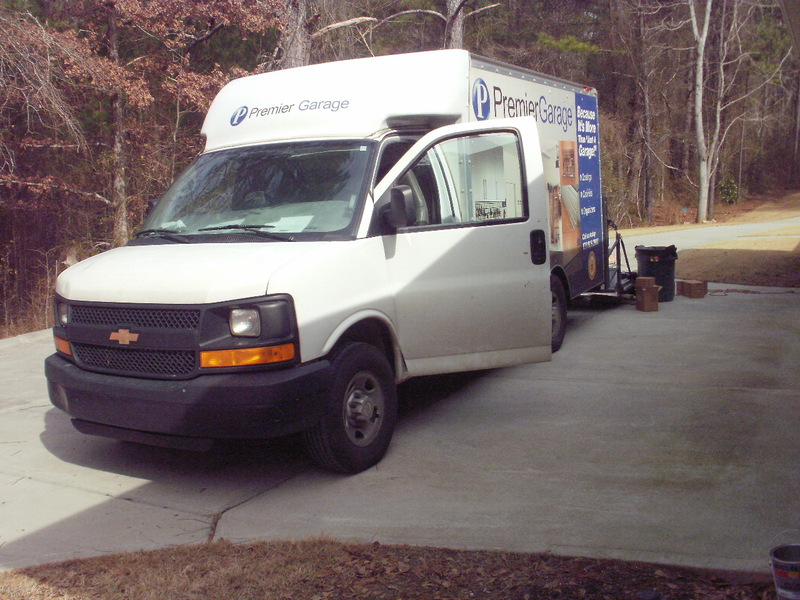 This way you will avoid the problem since the tires wouldnt be directly sitting on the floor. 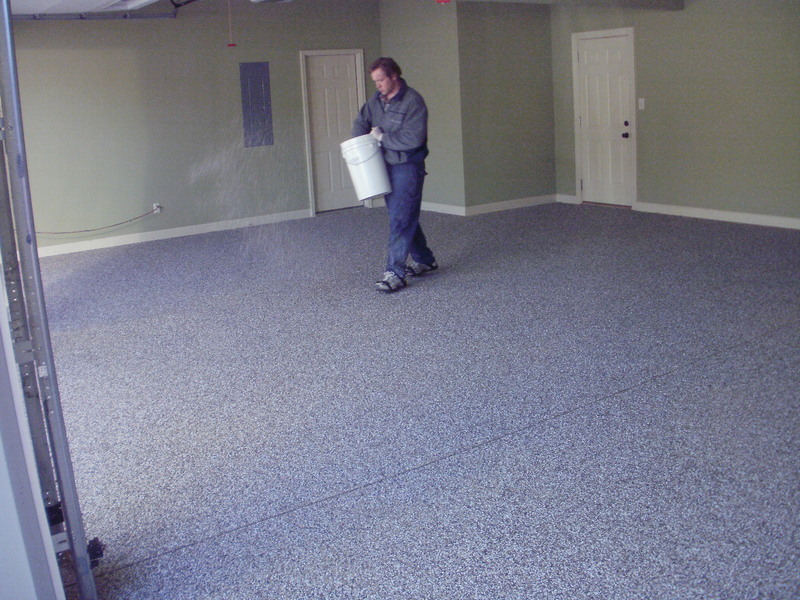 You have epoxy and polyurea. The polyurea stuff is like a Rhino liner. Plastic feel, but more durable than the expoxy and it really only takes a day before you can use the floor. You can DIY both kinds. I'd personally have someone come in and do a polyurea coating if I had to chose between the two. I prepped and applied the "roll-on-rock" system a couple of years ago. The prep for my space was especially hard because I had an oil-soaked mechanics pit (6ft deep X 16ft long X 3ft wide) that I had to de-grease. Also, I elected to cover the stem wall in the garage as well. All up, I covered about 700 square feet. 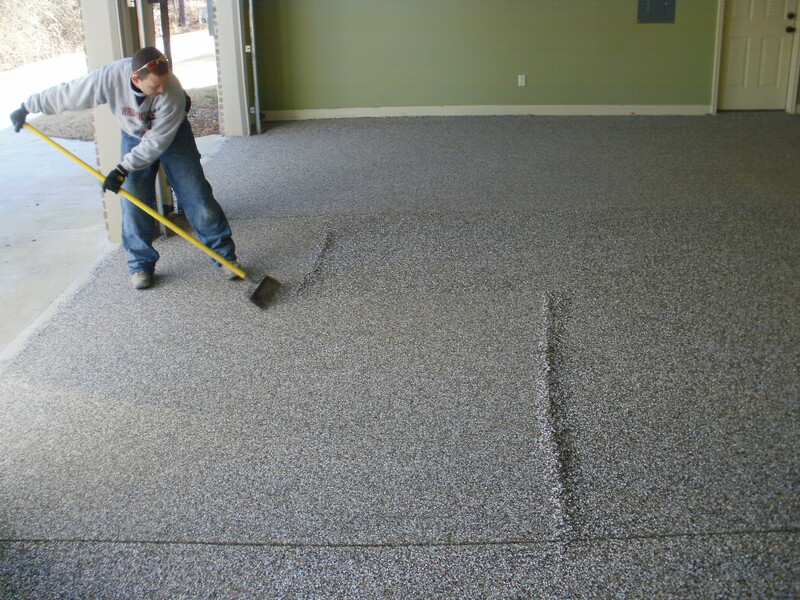 Including all prep and application, I have around 60 hours invested in the floor. It was hard work, but I couldn't be happier with the floor. It looks great and appears to be tough as nails (time will tell). I needed to remove a little bit of it from the stem wall after the application (for some wood finish work) and had to grind it off with a concrete wheel to get it off. After two years, it still looks like the day I finished it. Most of the coating is made up of the chips. You roll out the base coat, then throw chips until it "rejects" them. Since the chips are heavier than the base coat, they sink in and form a fairly thick layer. I was amazed how many chips it took. It took me hours just to throw the chips. Once it all sets up, you run some kind of blade across the surface to smooth it (I just used the "squeegie" attachement from my shop vac, which also sucked up any loose chips), then lay down a final sealer coat. I installed vct tiles and have been very happy with them I mop once a week or two depending on the weather and rewax once a year in the spring. You just have to keep the garage abave 45 to avoud shrinkage of the tiles. our garage floor concrete has a "sealer" that the contractor put on to us un-knowingly, apparently if there is a sealer it adds 3 steps to the process, just checked into this last week... looks like we won't be painting our garage floor anytime soon! Used Epoxy-Coat. Been on the floor for about a year now, and has held up very well so far. It's easy to DIY, but plan to spend at least a day in the prepping of the floor - cleaning w/ powerwasher, acid etching, filling cracks, etc. 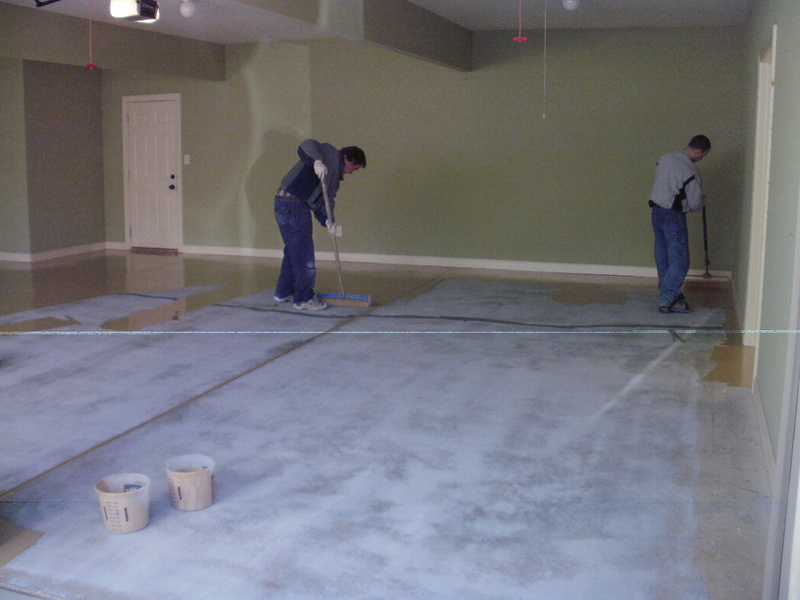 Then for the actual install, you'll need at least a second or third hand to keep it all moving along before it dries. I let it cure 48 hours before I drove onto it. ^Very nice, looks nice and grippy too. acid etching? 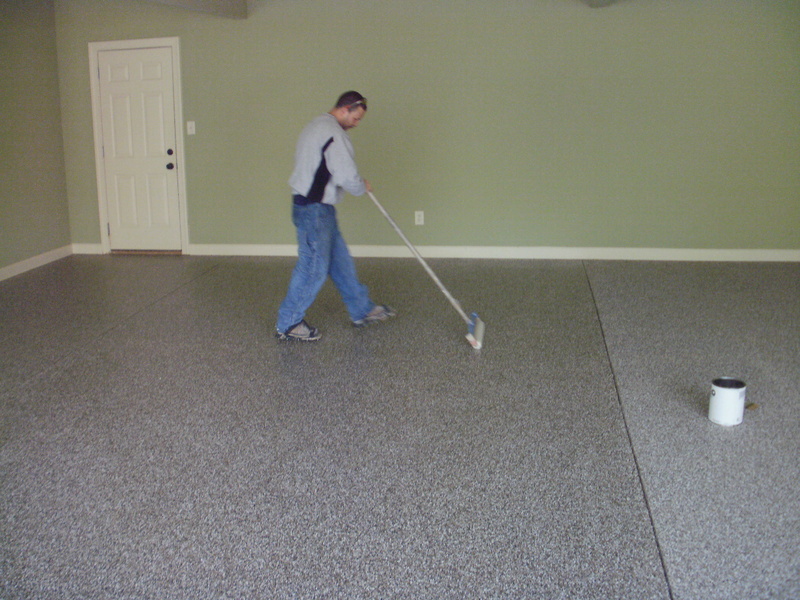 did you have a sealer on your floor? Thanks. I put a lot of it down on the walkways of the garage to ensure it's not overly slick. You really want underneath the car to be smooth as it will make the clean up easier. I had nothing down, but they suggest you do it. It's super easy with the kit, just get a portable sprayer from HD / Lowes, and it'll take longer to rinse clear and neutralize (you buy a couple of boxes of baking soda) than to actually do the etching. What's your price point? Polyurea is good and you can find people in Atlanta. I really like porcelain tile, but it's more expensive. I am willing to pay up for a product that withstand the abuse of moving machine tools (lathe, milling machine, surface grinder, etc.) and a four post car lift on wheels so unless it is crazy expensive the price is not the issue. I can't do tile due to the shaping of the garage floor. 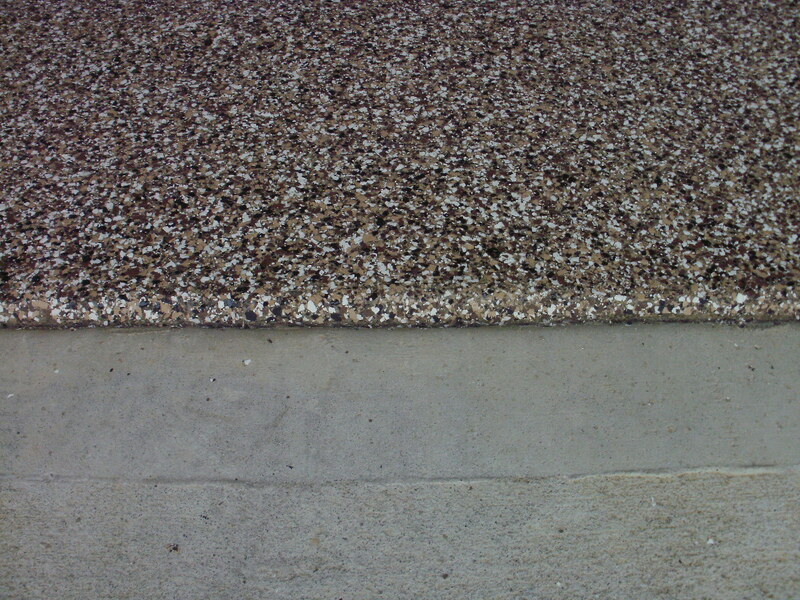 There are raised curbs along all the walls to channel water out the garage doors so the floor is not flat at the edges. Gotcha. Is the need for a coating/surface more than cosmetic or are we talking about just needing to clean things up? 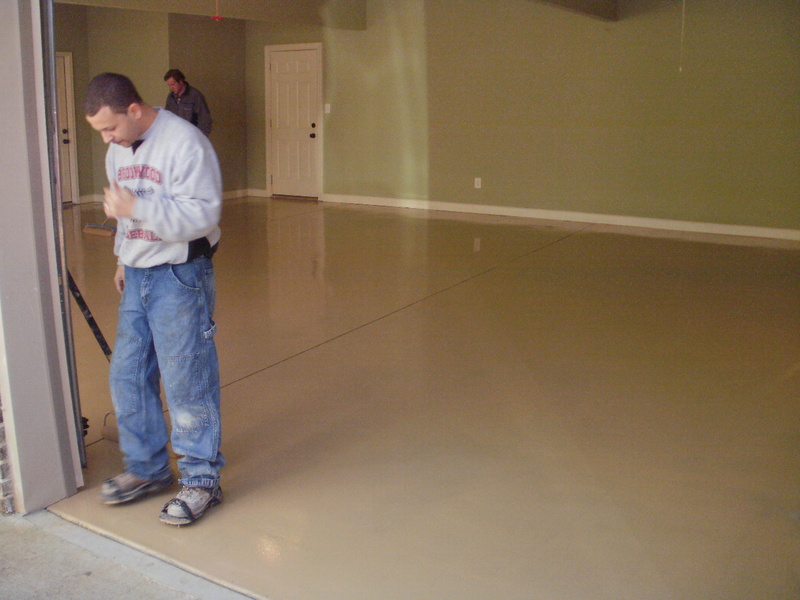 Polyurea is stronger than concrete, but it will still gouge with sharp objects just like concrete. Porcelain will take a lot more abuse. In a working shop with lots of sharp objects and welding etc you are often better off with the typical sealing and living with the look. I would also like the floor to have some "bite" to it so when it gets wet it is not slippery so again tile would not be my first choice. I really want the floor to be more functional (not holding oil stains and such) than beautiful, however only part of the garage will see the shop tools so it would be nice to have the area that will be just driven and walked on to look nice. 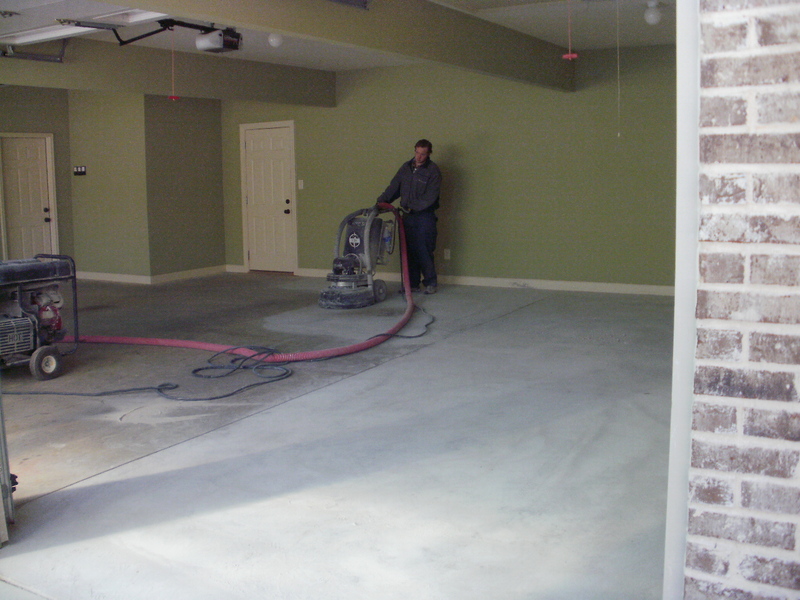 At my old house I had a bare concrete floor that was sealed a long time ago (read NOT very well sealed) and I grew very tired of trying to clean up spills and messes especially under my lift. 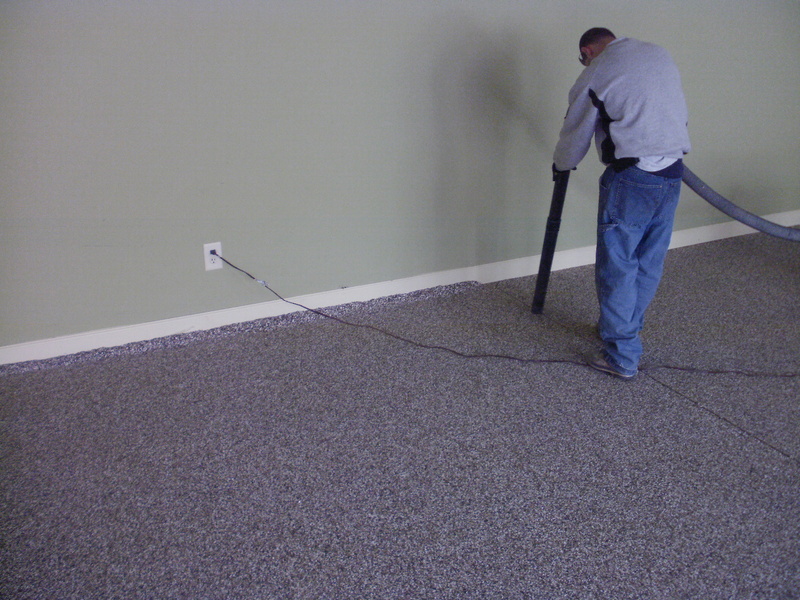 A lot of the stains became permanent and it was very hard to keep the floor clean of dirt and metal shavings. I want something durable that can be easily cleaned when needed and still look decent. So, after reading this post again, I guess I want it all! Last edited by tesprit; 01-25-2010 at 03:55 PM. 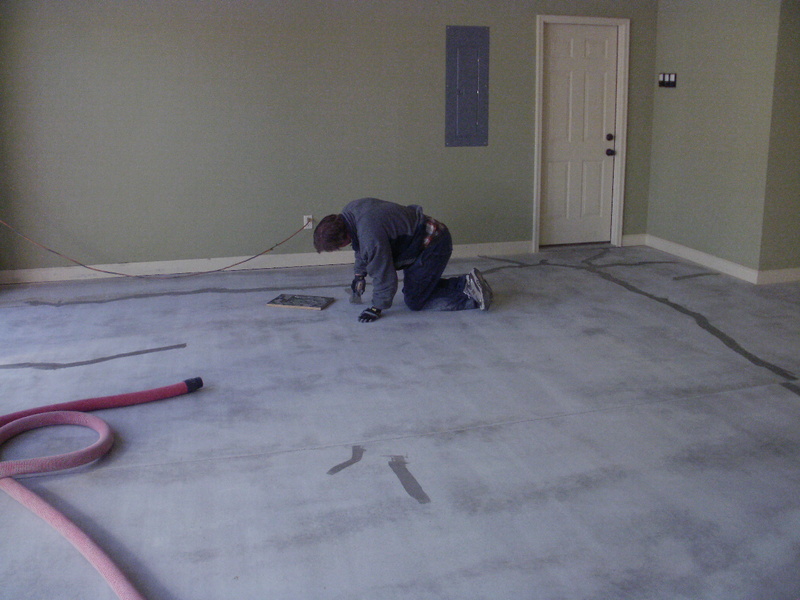 Finally, my cost for this coating was $4.29 per square foot (discounted from the normal $4.75) so this is not cheap. I'll see how it holds up and report back after a few months. Last edited by darkSol; 02-27-2010 at 08:19 PM.